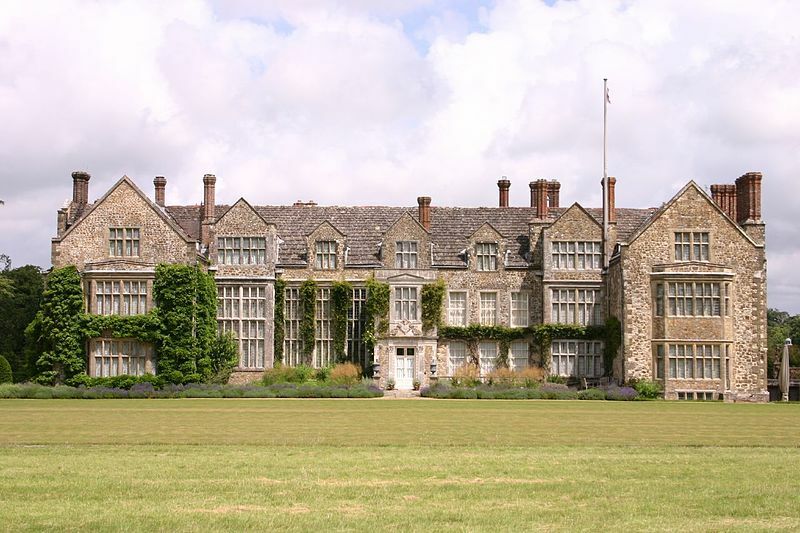 Parham House is a wonderful example of an Elizabethan building with a great hall and long gallery. It also has the most fantastic gardens and an excellent plant shop. The house and gardens are usually open from April until the mid October. Visit on Wednesdays, Thursdays, Fridays, Sundays and Bank Holidays. It is a short drive from Steyning by car or you can catch the number 100 bus. This runs every hour in the daytime, except on Sundays. I recommend visiting Arundel Castle and it’s attractive gardens. The castle overlooks the River Arun and was built at the end of the 11th century. The oldest feature is the motte (an artificial mound) which dates from 1068. You can see it in the photo below. Whilst you are in Arundel you can explore the small historic town and could also visit the museum, which is almost opposite the castle. 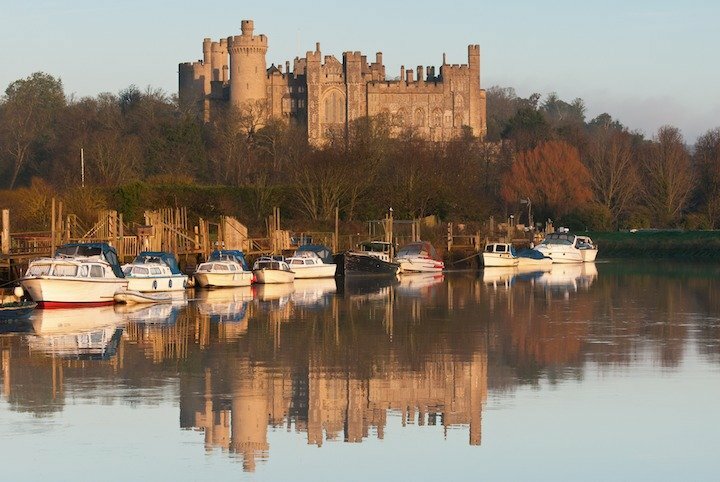 Arundel – Just half an hour away! I particularly recommend visiting the small town of Arundel – just a half an hour drive from Steyning. 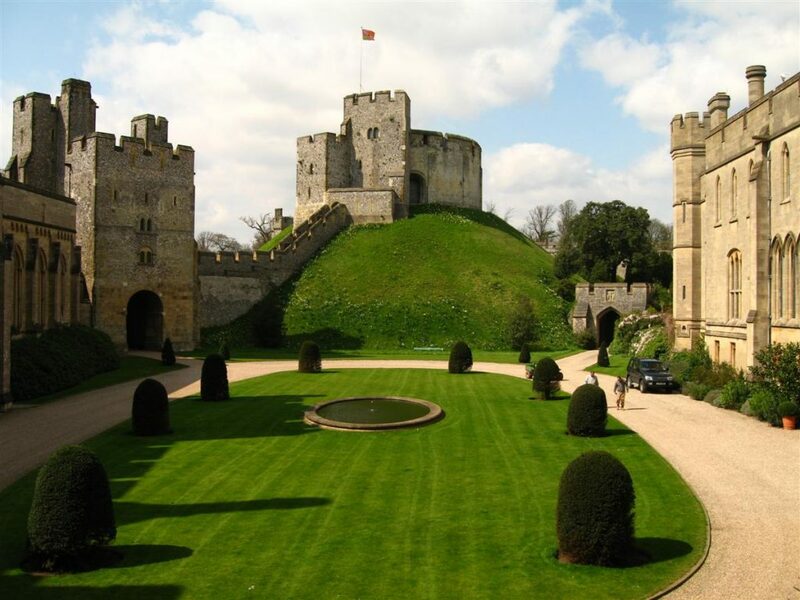 This famous West Sussex market town is most well-known for its 11th century Castle and its Victorian gothic cathedral. There are nearly 1,000 years of history at the castle, situated in magnificent grounds overlooking the River Arun. It was built at the end of the 11th century by Roger de Montgomery. The oldest features are the motte and the gatehouse. The motte is an artificial mound, over 100 feet high from the dry moat, and was constructed in 1068. The castle is open from Good Friday to the end of October on Tuesdays to Sundays, May Bank Holiday Mondays & August Mondays. Admission costs: Adults £9 (gardens) to £18; Seniors £9 to £15.50; Children £9. You can visit the cathedral at any time of year and admission is free. Explore more of the area’s history and heritage at Arundel Museum or look at the town from a different perspective at the Arundel Jailhouse and Ghost Experience! If you enjoy art you will be happy at one of the superb galleries. Interested in antiques? You’ll find plenty of shops with collectables. If shopping is your ‘bag’ then you’ll enjoy the wide range of contemporary and traditional independent shops. Water enthusiasts can hire a rowing boat on Swanbourne Lake or take a boat trips on the River Arun. If you love nature I particularly recommend a visit to the Wetland Centre. Perhaps you will just want to relax in one of the many cafes, bars and restaurants or in a traditional English pub! 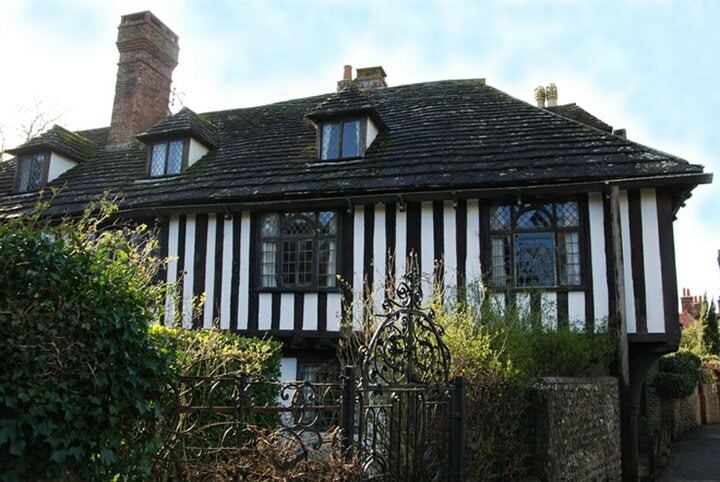 Bramber is just a mile from Steyning! I recommend spending time there and visiting the house and gardens at 15th century St Mary’s. 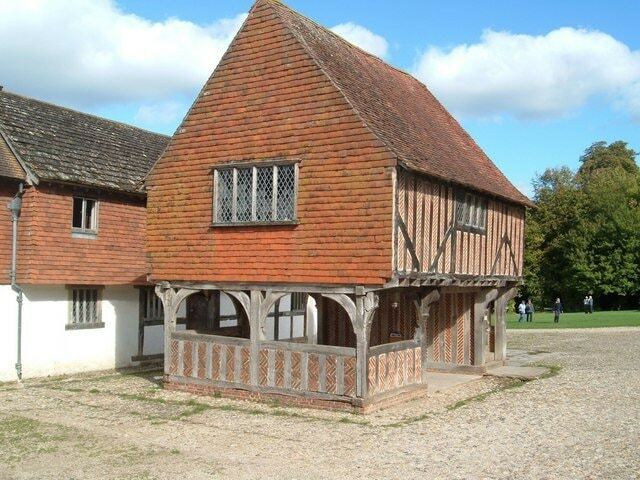 This timber framed building was constructed around 1470 by the bishop of Winchester. At that time pilgrims used the house as an inn on their way to the tomb of St Thomas of Canterbury. The house is open from the end of April to the end of September on Sundays, Thursdays and Bank Holiday Mondays (& Wednesdays in August) from 2 – 6 p.m. There are also some lovely cottage style tea rooms. Generations of holidaymakers and local residents have enjoyed visiting Worthing Pier. British seaside piers date from the early 1800’s. Worthing’s was the thirteenth to be built in England at a cost of £6,500. The first pile was driven into the seabed on 4 July 1861. Designed by Sir Robert Rawlinson, it was officially opened on 12 April 1862. The Pier still continues to bring enjoyment to visitors and residents. The Pavilion Theatre sits at the northern end and the southern end pavilion has recently been totally renovated and returned to its former glory as a cafe & venue (having been a night club for several years). An amusement arcade is in the middle. It is a regular attraction for people to take a stroll along the deck and for fishing. Worthing is 6 miles from Steyning & 10 miles from Brighton. St Andrew and St Cuthman’s Church in Steyning was built by the Normans in the 1080’s. The size of the church is an indication of Steyning’s importance. It was a major town in early Sussex. Admire the wonderful dog toothed decoration on the Norman arches inside the church! Go down Church Street off Steyning High Street to find this church. This picture shows the beautiful church of St Leonard in South Stoke village, near Arundel, West Sussex.. It was recorded in the Domesday Book – a great land survey from 1086, commissioned by William the Conqueror – when the village was named as “Stoches”. To find the church head for Arundel then travel down Mill Road until the road ends in a t-junction. Turn left, following the signpost to South Stoke. Go beyond the entrance to the farm and turn left with the road – the gate to the church is down a (signposted) short pathway to the right, about one hundred yards further on. Well worth finding! South Stoke is about a half hour drive from Steyning and close to the South Downs.